It is a bit of a wrench returning, from temperatures of 32 degrees and catching bonefish in tropical seas, to cold muddy river banks and pike fishing. 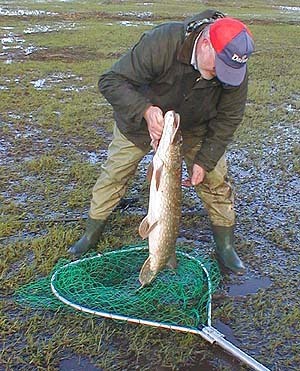 However, it's always a pleasure to go fishing with my pal Nigel and I needed no second bidding to give the pike a try. To be honest the river had been a bit grim recently with sudden changes in temperature seeming to put the fish off. However, the day dawned bright and clear and we had decided to try the afternoon, giving the water a chance to warm up a bit. A couple of days earlier a few of my friends had been piking in the same river and had struggled to catch anything - finishing up with a two pounder and a five pounder after a long session, so we were not too optimistic. 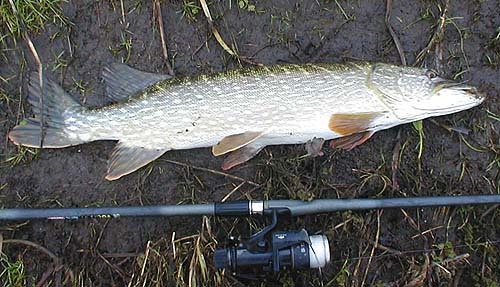 When we arrived the river was high and a bit coloured, not the ideal conditions for pike fishing. 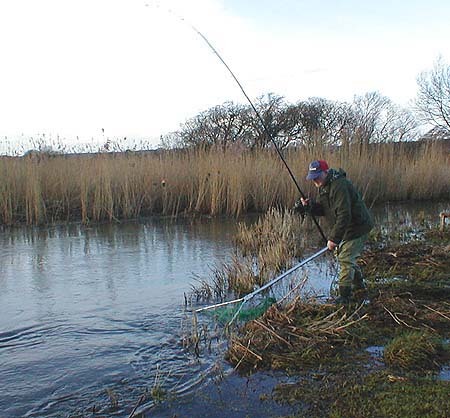 Anyway, we tackled up and began to trot our natural baits, suspended under small floats, round the likely spots. There were very few decent slacks in the high flow conditions and the first couple of places that we tried, although they looked pretty good in the circumstances, did not produce so much as a sniff. We moved on to try the prime place - a large oxbow - with me on one side of the slack and Nigel round at the other side. 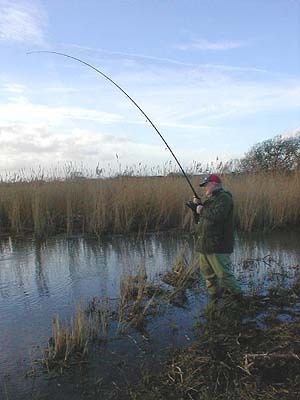 Before long I heard a great crash from Nigel's stance and when I asked if he had a fish he told me that a good pike had lunged and splashed at the bait just by his feet. I watched as he put on a smaller bait and began to fish again. We were pretty confident that the fish would have another go but it must have been ten minutes before I saw him strike. 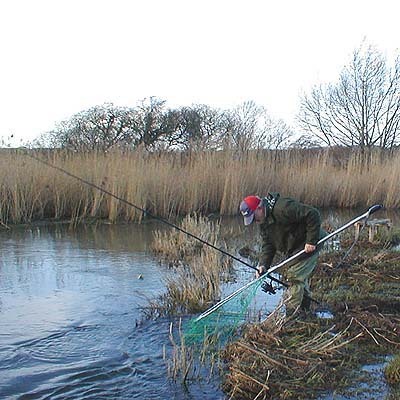 By the time I 'plodged' round to where he was standing the fish was still rushing about and taking line. I grabbed the camera and walked about taking a few pictures and chuckling as the pike made run after run and as Nige slipped and slithered about in the mud. Eventually he landed, unhooked, weighed and returned the fish - a sixteen pound beauty. We had no more bites. A couple of days later I had a fourteen pounder, from another slack a couple of miles upstream, which fought just as well as Nigels. Fantastic! There's more to fishing than sunshine and blues seas! 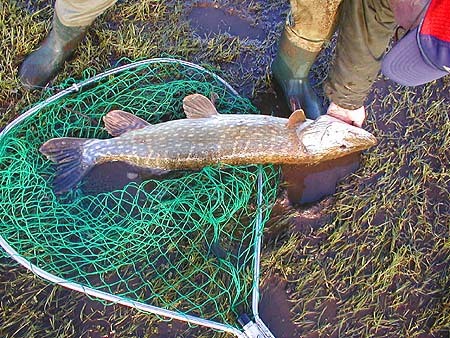 The fish is in the net.